Please refer to our stock # 616 when inquiring. 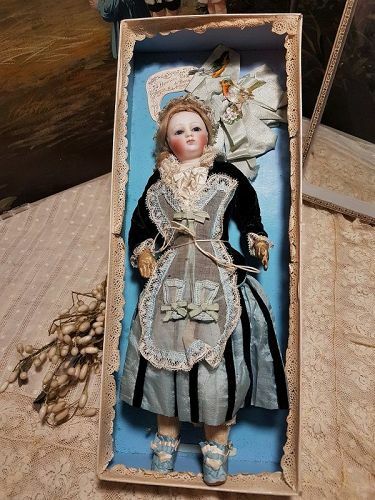 The rarity factors of this fine and mint condition circa 11, 5 " ( 30 cm ) doll included her small size and exquisite gentle beauty . In addition she owns a superb all original silk costume and under wearing with stocking and silk shoes which was never removed from her body . All preserved in an lovely glass - lid presentation box ( circa 15 " x 6" / 38 x 15 cm ) matching to her outfit !!! Mademoiselle has best pale quality of bisque and painting , bisque swivel head on kid - edged bisque shoulder plate. Cobalt blue glass enamel inset eyes with dark eyeliner and fine painted lashes and brows . She has an closed mouth with accented kiss lips , her ears are pierced into the head. Lovely blonde mohair wig over cork pate has original braids . Original French kid poupee body with gusset - jointing at elbows ..... hips and knees . She has generally excellent condition of bisque head and breast plate , free of damage , chip , hairline or repair . Has original kid body also generally excellent with fine stitched separate fingers. Superb and never removed all complete outfit of light blue and black silk and silk velvet , has matching muslin apron and cap , rich set of muslin under garment and stunning silk shoes with stocking. This offer are for the factory original presentation box with fashion doll , the almond eye Jumeau poupee belongs not to this offer !! Layaway are always welcome , please ask about it .... thank you ! !